In my quest to find the perfect blend of retro and modern for my master bathroom remodel, I have plenty to consider. Which elements of the bathroom redo will be more modern, which will be more retro and most importantly, how will I blend the two styles? While I’m letting all those questions spin around in my brain, I thought I would delve into the world of lighting to start figuring out what is out there and what types of fixtures might go well together in a retro modern bathroom…. 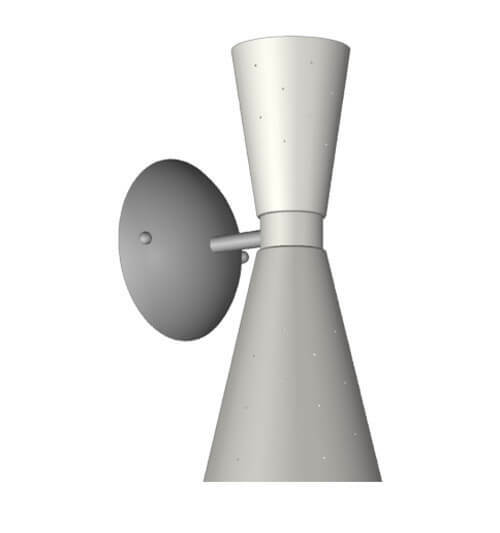 Above: Glomar 1-Light 6 in. Ceiling Mount with Frosted White Glass Finished in Brushed Nickel – $10.61 from Home Depot. — This is a classic choice, especially for small spaces and limited budgets. 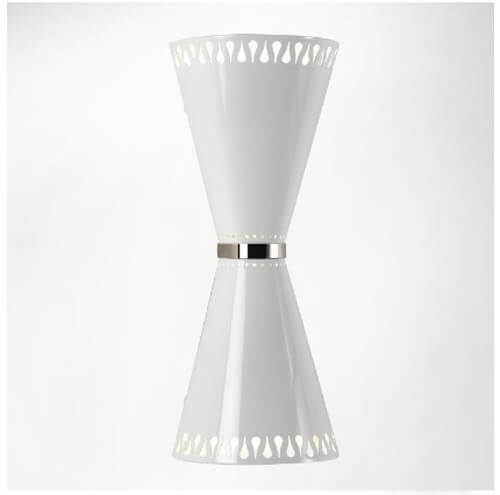 While I like the simple design of this light (and the price) I don’t think it is large enough to light up my master bathroom, however it would be retro cute in a half bath or entryway. Above: CALYPSO Ceiling lamp – $29.99 from IKEA. This one is a modern design with a midcentury feel. Its size and shape are reminiscent of some of the large, original saucer shaped light fixtures that are in two of my bedrooms. 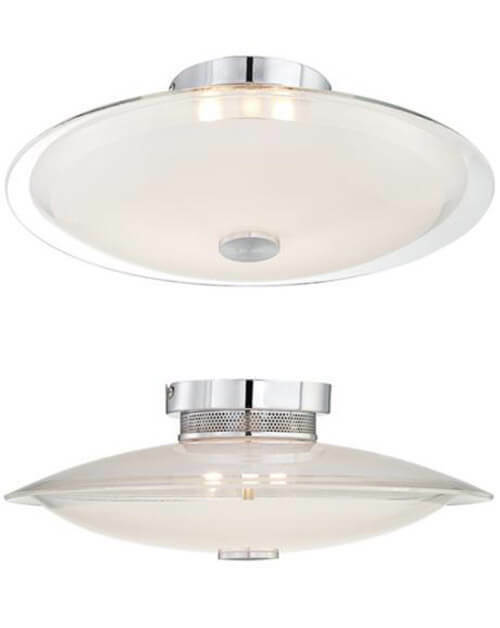 Above: Possini Glass Disk 15″ Wide Round Ceiling Light — on sale for $49.95 from Lamps Plus. This model reminded me of the retro “UFO” style lights from the 1950s and 1960s. At 15 inches in diameter, and mostly glass, it is a nice size light and would likely do a good job of filling my master bathroom with light. Above: Contour Semi-Flush Fixture – White — $69.00 from West Elm. This model has just the right amount of retro lines (think Saarinen tulip table) while also looking modern. 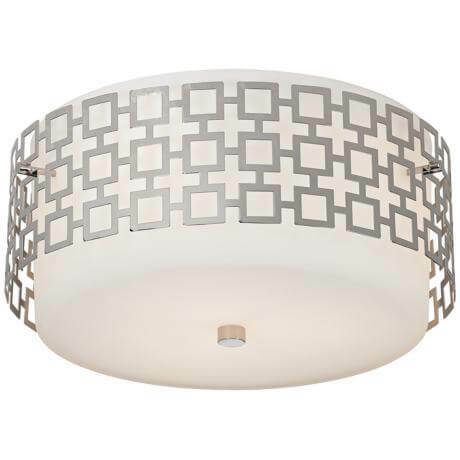 Above: Jonathan Adler Parker 15 1/4″ Wide Nickel Ceiling Light — $271.99 from Lamps Plus. This light (which Pam posted about earlier) is not only chrome and fun, but injects a bit of pattern to an otherwise boring ceiling. 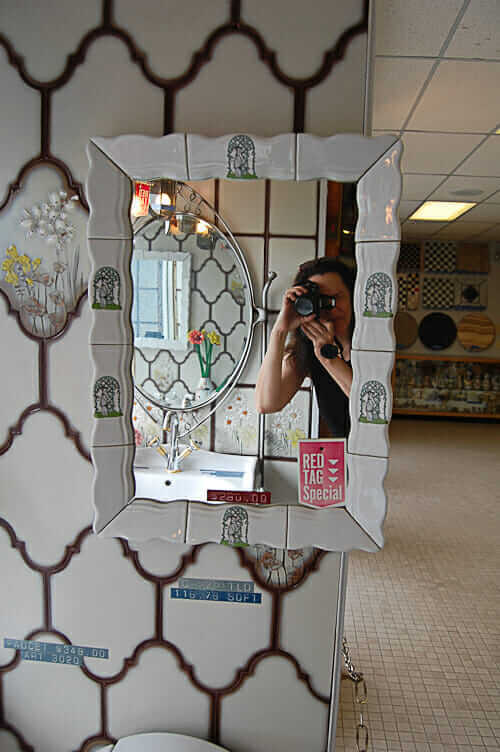 If I decided to use one-inch square mosaic tile, this would be a good way to echo its shape in other areas in the room. Above: Holtkoetter Satin Nickel 7 3/4″ Wide Ceiling Light Fixture — $458.91 from Lamps Plus. While pricey, this light could be a showstopper when used in the right place. The chromed tulip base and oval globe are about as modern mixed with 1960 as you can get. Above: Nuvo 76/277 with Diamond U Channel Glass, White — $25.99 from Amazon. I’ve always liked retro bath light bars for use over the mirror. I think they cast a flattering light for putting on makeup, doing hair, etc. This one is affordable and comes with a retro-esque pattern. Above: 4-Light Bath Bar — $22.97 from Home Depot — Of course there is always the Ebay, Etsy, ReStore route for this style of light (and many other cool, original lights can be found there), but if I couldn’t find a suitable vintage style for my master bath remodel, this light could easily by painted or stenciled with a starburst or geometric pattern to make it look more authentic. Above: Bel Air Lighting 2-Light Polished Chrome Bathroom Vanity Light — $59.62 from Lowes. I think this more modern bath light bar would also give off a flattering glow, and its clean design and shiny chrome center would also mesh well with a retro look. Above: Stella — $290 from Rejuvenation. This bath light bar, which Pam debuted on the blog shortly after it was released, made my list because of the vast area of pin hole chrome in the center of the light. Many of my house’s original fixtures are pin hole chrome lights, therefore this fixture would feel right at home in my master bathroom. I also like the unique sloped glass ends, which would add to the individuality of my master bath. Above: George Kovacs Energy Efficient 12 1/2″ High Wall Sconce –$108.91 from Lamps Plus. This modern chrome sconce is very sleek and minimal, but it also has a slight taper — which reminds me of the tapered legs on so many retro furniture pieces — to keep it interesting. Above: Gemini — $285 from Rejuvenation. One of my favorite retro shapes is the bow tie. This sconce’s silhouette has me all kinds of excited, plus the large areas of glass would likely create a lovely glow. If I were to do sconces in my master bath, I’d likely want one on either side of the mirror — but, two of this particular sconce might be a little out of the budget for my project. Above: Galaxy — $229 from Rejuvenation. Here’s another cool chrome pin light. I think it would fit well in my house and look awesome flanking my bathroom mirror, but I do have to wonder if pin hole lights are flattering for the complexion. Above: Jonathan Adler Parker Collection 15″ High Nickel Wall Sconce — $178.99 from Lamps Plus. Here’s the sconce version of the ceiling lamp mentioned above. 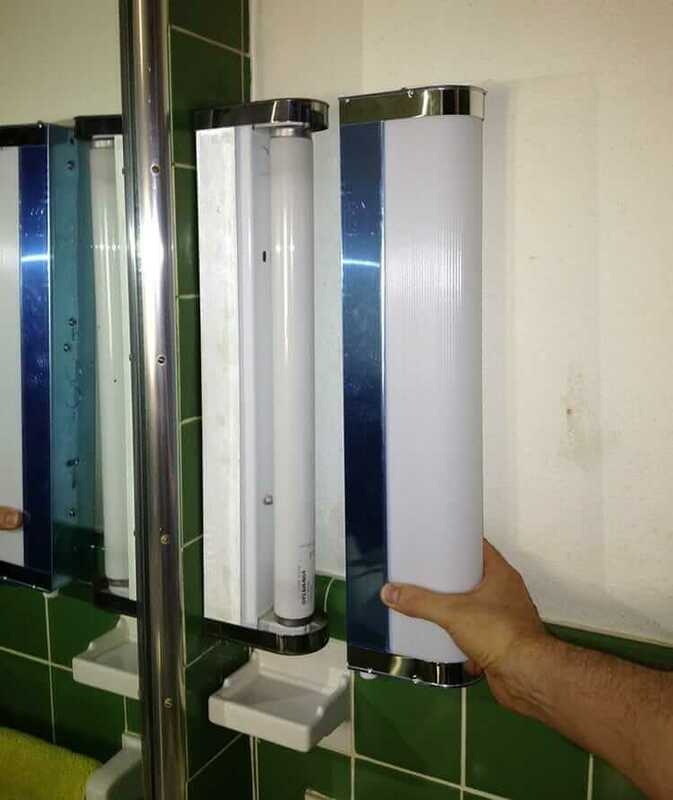 These would be great on a plain wall flanking the bathroom mirrors, but if I decided to do some sort of attention grabbing backsplash around the sink, I’d stick with a more simple lighting style. Above: Jonathan Adler Havana Half-Wall Sconce — $195 from JonathanAdler.com. Here’s yet another bow tie shaped light sconce. This particular model looks a touch more modern and sleek to me, but the cut outs add a nice bit of vintage charm. Above: Jonathan Adler Capri Wall Sconce — $225 from JonathanAdler.com. This sconce comes in several colors (though orange is always my favorite) but mixes chrome with an interesting, torch-like shape. With the right color scheme and placement, a pair of these sconces could be a show-stopper in a retro modern master bathroom. Of course I still have to make a few more trips to my local ReStore, scour Craigslist, Ebay and Etsy and decide which way some of my other bath elements will lean, but now I have a good idea of what kind of retro and modern styled lighting is available. My retro/modern mixing muscles are beginning to tone up and are getting ready for my master bathroom renovation. Have you added new or vintage lighting to your bathroom? What did you choose? I think the light fixture(s) should be the last thing you select. 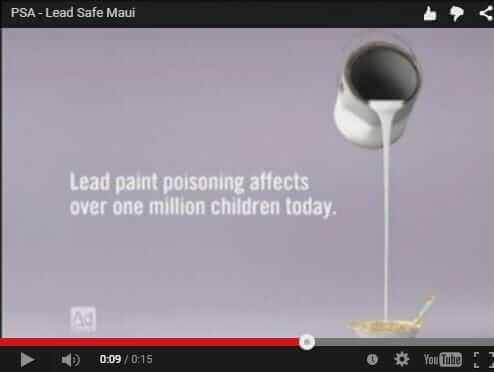 Wait and see what goes good and feels right with the other fixtures you will have selected for the remodel. Also if you want to see the most excellent representation of 50’s bathroom design check out the movie “the Master”. Also authentic for 50s hair, costuming, set design, you name it. The movie itself, well that’s another story. If anyone is still looking, the yellow sconces are on sale for $115 at homeclick, comparatively a good deal for anyone seeking a pop of color. ebay has lots of options as well.